This week I managed to completely miscalculate a glaze recipe, despite checking the total still added up correctly. Somehow x+y+z=100, but 2x +y/2 +z/2 also =100 (to simplify the check). How weird is that? So instead of a misty, satin finish, I got a clear crackle glaze. Doh! I started remaking the glaze, with the correct recipe, and it was only when taking a snap of the pot for my glaze book that I really looked at it. You probably have to click on the thumbnail yourselves to see it bigger, to really see what it’s like. 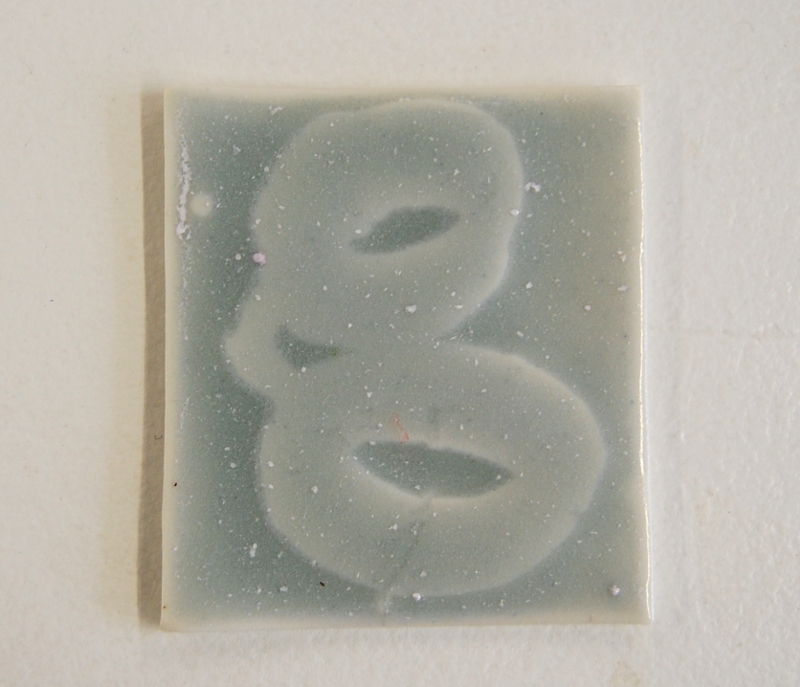 One of the great things with porcelain glazes is that they are often thick – one millimetre is not unusual. 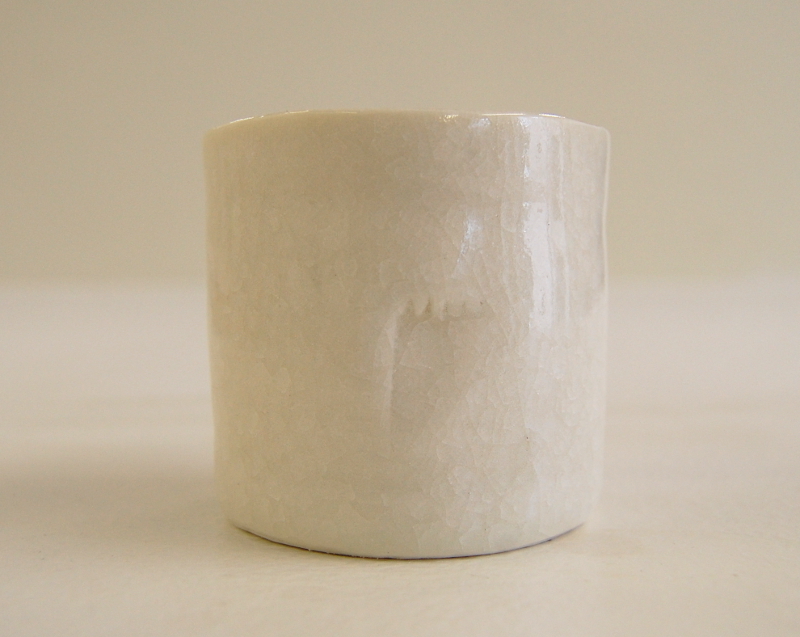 So looking at the pot at an angle changes the look of the glaze. This glaze has crackles internally – the surface is perfectly smooth to the touch – something only possible with this kind of thickness. These effects are hard to show in a digital image. They are subtle in ‘real life’. 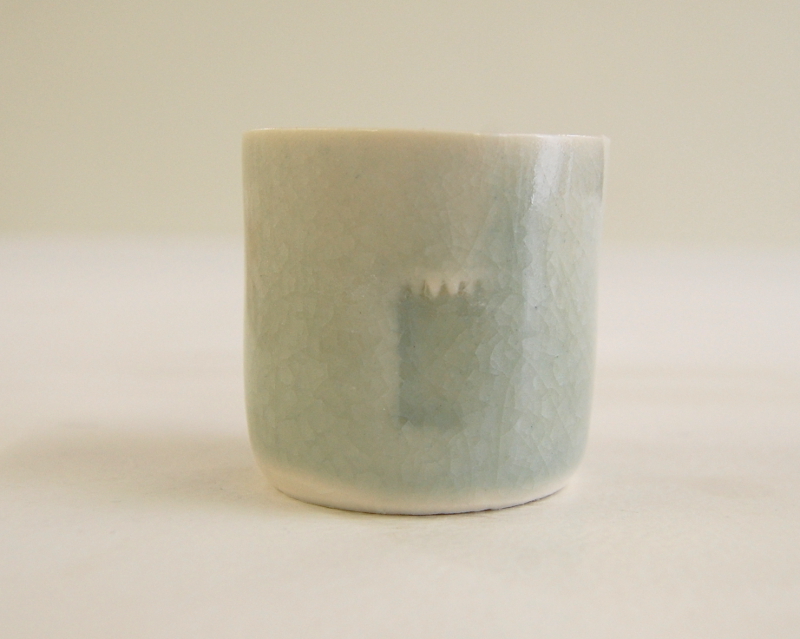 But maybe that’s the real pleasure of this kind of ceramic: it catches your eye, looks different, at different times of day, or as you pick up and use it. It makes you want to feel it – see how the crackle manifests, work out what is making the difference. Like blanc de chine, part of the pleasure is in the disconnect between appearance and feeling. It’s intriguing. And one of pleasures that doesn’t translate into the digital world: which is good – try living in your bodies, folks! – and bad: no-one online can see the point. So I’ve gone back to the recipe – luckily, as I always write down the recipe again, carefully, and tick off the ingredients as weigh them out (the ‘care’ part of the title of the post), I can re-make the ‘wrong’ glaze. 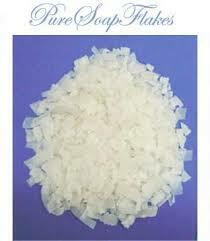 Where it’s thicker, it has a snowflake quality – like soap flakes – ‘LUX’, if you remember. So more testing required. The crackle’s already making me thing of new shapes, words… glacier, floe, tundra. I need to look up some of those 600 words for snow…. 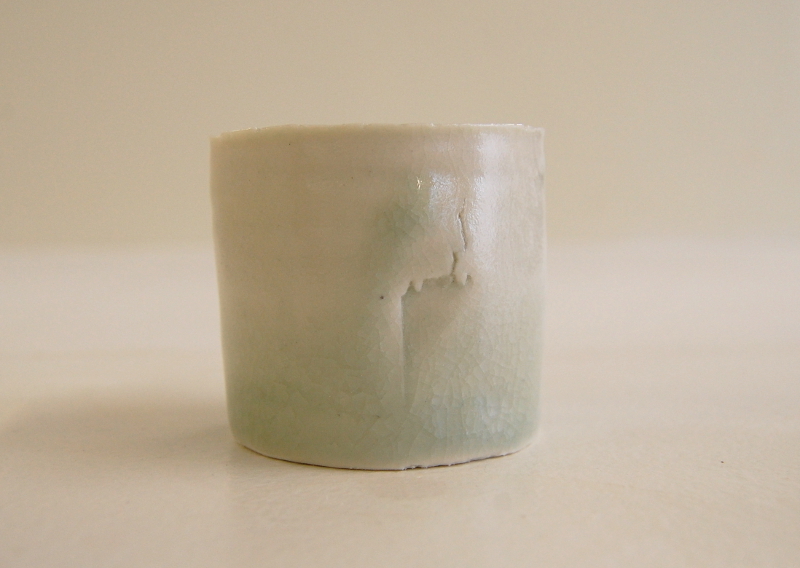 Mistakes don’t always lead to new glazes. The flecks on this test come from bad mixing. I should really have sieved it again. It’s a strange anomaly, that a kind of careful mistake is the best one. Or maybe it’s about attention?